AES+F achieved worldwide recognition and acclaim in the Russian Pavilion at the 52nd Biennale di Venezia in 2007 with their provocative, other-worldly Last Riot (2007), the first in a trio of large-scale, multichannel video installations of striking originality that have come to define both the AES+F aesthetic and the cutting edge of the medium’s capacities. 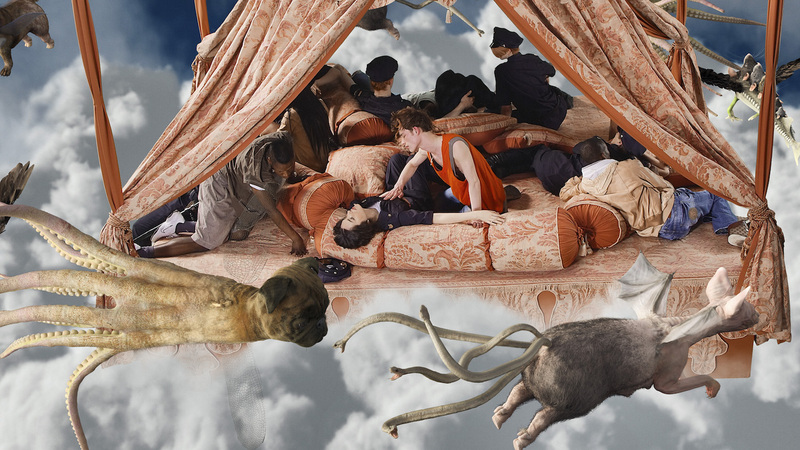 The second of the series, The Feast of Trimalchio (2009), appeared in Venice in 2009, and the third, Allegoria Sacra (2011), debuted at the 4th Moscow Biennale in 2011. United as The Liminal Space Trilogy, this tour-de-force series was premiered in September 2012 at the Martin-Gropius-Bau, Berlin, and the Moscow Manege, the central exhibition hall of the artists’ home city. The Trilogy was shown in the Museum of Fine Arts in La Chaux-De-Fonds, Switzerland (June–September 2014). Most recently all three videos were shown at Albright-Knox Art Gallery, Buffalo, NY (June-September 2015). In 2015 AES+F presented the new project Inverso Mundus at 56th Biennale di Venezia. AES+F received Sergey Kuryokhin Award 2011, the main award of the Kandinsky Prize 2012, the main award of the NordArt Festival 2014, and Pino Pascali Prize 2015 (18th Edition) – all for the project Allegoria Sacra. AES+F were awarded Bronze Medal (2005) and Golden Medal (2013) of Russian National Academy of Fine Arts. AES Group was originally formed in 1987 by the conceptual architects Tatiana Arzamasova and Lev Evzovich and the multidisciplinary designer Evgeny Svyatsky. Exhibiting abroad from 1989, the group expanded its personnel and name with the addition of the photographer Vladimir Fridkes in 1995. AES+F’s recent work has developed at the intersection of photography, video and digital technologies, although it is nurtured by a persistent interest in more traditional media — sculpture especially, but also painting, drawing and architecture. Deploying a sophisticated, poetic dialogue among these media, and plumbing the depths of art history and other cultural canons, AES+F’s grand visual narratives explore the values, vices and conflicts of contemporary culture in the global sphere. For more than a decade, works by AES+F have been showcased in signature festivals and biennial exhibitions of contemporary art around the world, including — in addition to Moscow and Venice — those of Adelaide, Gwangju, Havana, Helsinki, Istanbul, Kiev, Lille, Lyon, Melbourne, St Moritz, Sydney, Taipei, Tirana and Toronto. Their work has also been featured in influential events devoted to new media — such as ARS Electronica (Linz), Mediacity Seoul and Video Zone (Tel Aviv) — and photography — such as FotoFest (Houston), Les Rencontres d’Arles and Moscow’s Photo Biennial. By now the subject of almost 100 solo exhibitions at museums, exhibition spaces and commercial galleries worldwide, works by AES+F have been shown in such prestigious venues as the Neuer Berliner Kunstverein, ZKM (Karlsruhe), Casino Luxembourg, Kiasma (Helsinki), the Moderna Museet (Stockholm), Tate Britain (London), Institute of International Visual Arts (Iniva, various UK venues), the Passage De Retz (Paris), the Vanhaerents Art Collection (Brussels), MACRO Future (Rome), the Museo Thyssen-Bornemisza (Madrid), the State Russian Museum (St Petersburg), the Museum of Fine Arts (La Chaux-de-Fonds) and many others. Among the important European institutions collecting their works are the Moderna Museet (Stockholm), the Sammlung Goetz (Munich), the Neue Galerie Graz, the Maison Européenne de la Photographie (Paris) and the Centre Georges Pompidou (Paris). Works by AES+F are also presented in Australian public collections at AGSA / Art Gallery of South Australia (Adelaide) and MONA (Tasmania). Their works are also found in the foremost collections of Russia, including the Multimedia Art Museum Moscow, the Moscow Museum of Modern Art, the State Tretyakov Gallery (Moscow) and the State Russian Museum (St Petersburg).